At Litmus Wines we offer UK grape growers a premium, bespoke contract winemaking service at Denbies Wine Estate in Surrey. With state-of-the-art winemaking facilities at our disposal, our client’s wines are managed by a team that have a passion for quality winemaking, offering a complete, transparent and flexible service for all wine styles. Transparency starts with the cost of our services. We have designed 2 online cost calculators to aid clients in their business planning. Chief Winemaker, John Worontschak oversees the winemaking and is assisted by the internationally experienced French winemaker Matthieu Elzinga. John’s aim is to maximise the quality potential of the grapes brought to him and provide the grower with the style and quality that they envisaged and deserve. Traceability of product and communication with the customer are key to our success. John has over 30 years of winemaking experience within the UK and abroad and set up and ran the highly successful Harvest Wine Consultancy at Stanlake Park (Valley Vineyards) from 1989 through 2002 winning the Gore Brown Trophy in 1992,1993,1994,1996,1997 and 1998. John has consulted to wineries around the world on all aspects of the wine business and is the Director and chief winemaker of Litmus. John is an Australian trained winemaker and a Panel Chair at the International Wine Challenge, thereby is able to utilise not only the latest techniques in winemaking but also crucially how these can be harnessed for market acceptance in terms of stylistic direction. Mike Florence spent nine years as General Manager of the International Wine Challenge before joining Litmus. Organising every aspect of the world’s largest tasting event has provided Mike with not only an enviable knowledge of the world of wine but a great ability to organise and liaise with clients and keep on top of a bewildering array of facts and figures. Mike is always on hand to discuss the client's latest needs. Matthieu Elzinga's CV is impressive reading. At the age of 15 he was a hands on winemaker at the family vineyard in the Loire Valley, his winemaking experience includes vintages in Margaux and Piemonte, he has studied extensively in Champagne and for 11 years he ran his family's 210 hectare vineyard and winery in Muscadet whilst also taking on the responsibility of chief winemaker. Today, Matthieu is in charge of the day to day winery operations for Litmus Wines and is always available for any clients who wish to review the progress of their wines at any stage of the operation. Matthieu is dedicated to wine quality and to the attention to detail that is so necessary to produce premium wines. 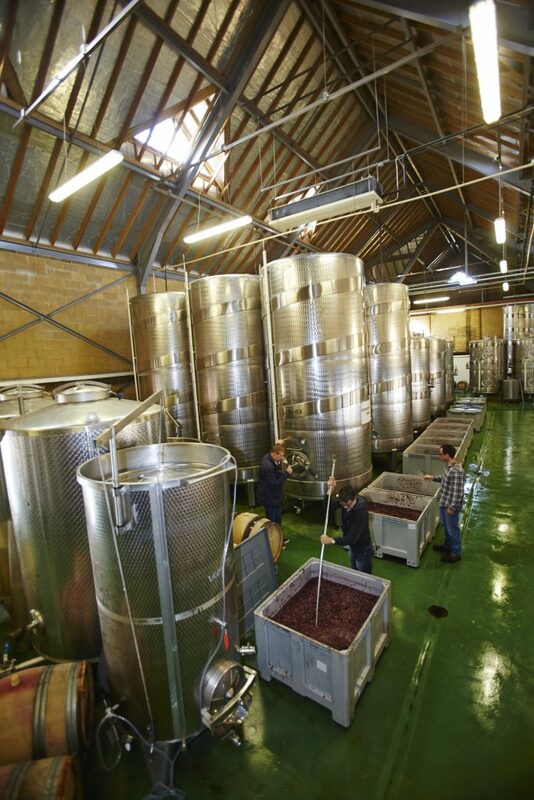 Being a larger winery ensures that we can take the time to get things right. With a large array of goods and services on hand we can ensure the latest and most appropriate techniques can be utilised to achieve your desired goals in a fully traceable manner. Crucially this infrastructure in both personnel and equipment means we have the capacity to take the time to communicate with our clients and to service their needs thoroughly. SALSA accredited facilities and winery software management systems. Organic and biodynamic Demeter certified. Litmus wines fees are transparent, flexible, fair and good value. The transparency and flexibility is evidenced in the Cost Calculators. It has always struck us as odd that some contractors charge a fermentation fee on juice that is lost in process and that pressings fractions are not talked about. We deal with these and other issues, offering payment for the pressings if desired and charge for dry goods at cost +10%. That's all fair. We are not and never desire to be the cheapest winemaking contract providor, however taking in to account all of the above we represent excellent value for those aspiring to the best achievable quality. For a full list of services and prices please contact [email protected]. We have the following guidelines to help clients plan and prepare the delivery of fruit to the winery. These conditions are the ideal and should be the norm. No doubt at times they will vary due to circumstance that will need to be accommodated. Delivery of fruit must be booked with a minimum of 48 hours notice by contacting Marcus Sharp at [email protected] Unscheduled fruit may incur considerable processing delays. Picking bins are the responsibility of the grower. Denbies are unable to provide crates for hire. Fruit delivered before 7pm will be processed on the day. Fruit delivered after this time may be held over until the next day. Where there are signs of rot, sprinkle with PMS (40g/tonne) before loading evenly over all the bins. Upon arrival the bins will be unloaded and weighed, processed and rinsed for you to take away. It is a legal requirement to complete a Commercial Accompanying Document (CAD) form and send it with the delivery of fruit. This document can be downloaded from http://food.gov.uk/multimedia/pdfs/wsb15.pdf.